Recently I was honored to be interviewed by Mamadou Dakouo for his company DataSteps. How did I learn SAS? What is my favorite SAS procedure? For the details you can watch the 6 minute video. These days SAS programmers have more choices than ever before about how to run SAS. They can use the old Display Manager interface, or SAS Enterprise Guide, or the new kid on the block: SAS Studio. All of these are included with Base SAS. “You’re using Display Manager,” I explained, but she had no idea what I was talking about. Trust me. This person is an extremely sophisticated SAS user who does a lot of leading-edge mathematical programming, but she didn’t realize that Display Manager is not SAS. It is just an interface to SAS. Personally, I think all of these interfaces are keepers. At least for the near future, all three of these interfaces will continue to be used. What we are seeing here is a proliferation of choices, not displacement of one with another. So what’s your SAS interface? In celebration of SAS Press’ 25th anniversary, Lora Delwiche and I reminisced about what it was like writing the first edition of The Little SAS Book. You can read about it on The SAS Learning Post. SAS Press has been publishing books written by SAS users for 25 years. That made me wonder: Who wrote the first such book? The answer depends on how you phrase the question. You can read about it on the SAS Learning Post. Have you been thinking about ordering a SAS book or two? Now is the time to do it. SAS Press is a quarter century old. To celebrate, they are offering a 25% discount on books ordered by December 31, 2015. 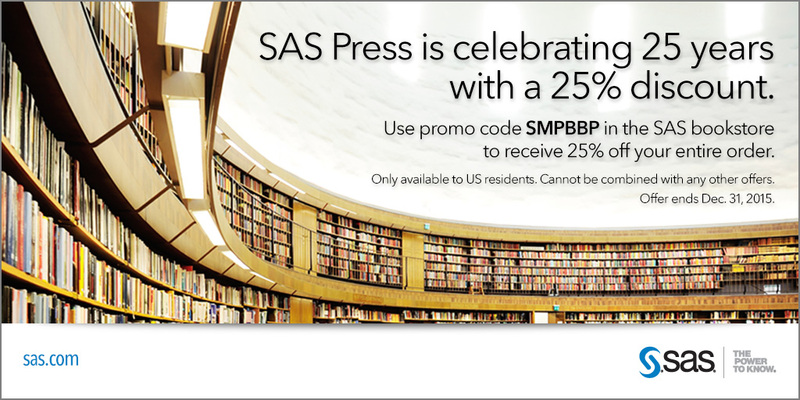 To get the discount, use the promo code SMPBBP when you place your order at support.sas.com/publishing/ (only available in the US). Since SAS Press always has FREE SHIPPING for books, this means you get a real bargain. 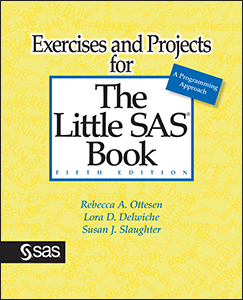 For example, if you were to order The Little SAS Book, Fifth Edition from Amazon.com, it would set you back $47.30. But with the SAS Press 25% discount, the same book costs only $41.21. Such a deal! My question is this: Will they offer a 50% discount in another quarter century? We will just have to wait and see. One of the challenges we faced in writing exercises was how to create questions that were thought-provoking and yet not too complicated for people who are just starting to learn SAS. Our goal was not only to test readers’ knowledge, but to solidify that knowledge so they will remember what they learn. That’s why we included different types of exercises. Multiple-choice exercises are quick and easy, open-ended short answer exercises encourage readers to think a little more deeply about the material, and then programming exercises challenge readers to apply what they have learned. The following questions are examples of the three types of exercises found in our book. For help with these exercises, see section 4.13 “Producing Tabular Reports with PROC TABULATE” in The Little SAS® Book, Fifth Edition. 1. For variables listed in a CLASS statement, what statistic will PROC TABULATE produce by default? 2. If you specify two dimensions in a TABLE statement in PROC TABULATE, which dimensions will you get? 3. Explain what happens to observations with missing values for variables listed in a CLASS statement in PROC TABULATE. Describe an option you can use to change this default behavior. 4. Is it possible to write a TABLE statement in PROC TABULATE that specifies a row dimension but no column dimension? Explain your answer. 5. A friend, who has recently begun bird watching, keeps a list of birds. For each species, she records its name and three one letter codes. The codes indicate whether or not she has seen that species (S for seen, or N for not seen), the type of bird (G for game birds, S for songbirds, R for raptors, or W for waterfowl), and whether or not that species is migratory (M for migratory, or N for nonmigratory). Use the data in her list to create summary reports. a. Write a DATA step to read the following raw data into a SAS data set. b. Using PROC TABLULATE, produce a report with counts that specifies rows for the type of bird and columns for whether the bird has been seen. Be sure to include an appropriate title. c. Create user-defined formats to replace the one letter codes with formatted values for the type of bird and whether or not it has been seen. Rerun the report using the new formats. d. Use a different procedure to produce the same counts. Then add a comment to your program describing the differences between the two reports. We hope that you found this information helpful. Visit the book page for additional information, reviews, and a free book excerpt.